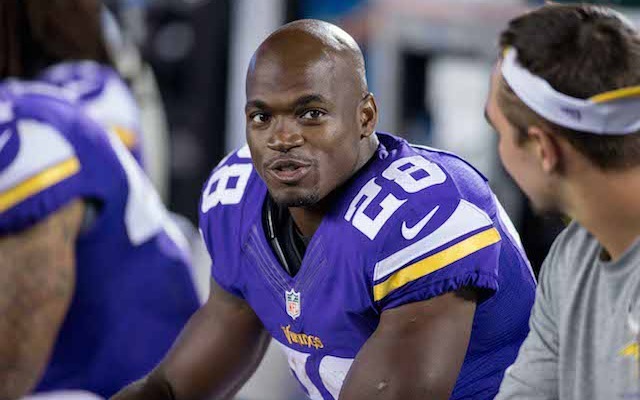 According to multiple reports, the Patriots will host free agent running back Adrian Peterson at Gillette Stadium today. Peterson had a nightmarish season in 2016-17, playing in only three games before tearing his meniscus and missing the remainder of the season. He is also 32 years old, which for a running back, especially with his aggressive, power running style, doesn't bode well for his value moving forward. However, Peterson in a Patriots uniform would be a little weird when one considers what Jonathan Kraft had to say about him in 2014 right after he beat his son with a switch. "I just don’t get it, so it is hard to comment on. Other than the fact the way I was brought up and the way I brought my children is you don’t lay your hands on them. From where I sit it is completely unacceptable and as abhorrent as what we have been talking about [with Ray Rice]. It was interesting hearing some people raise a defense about it being cultural and I can’t comment on that. “Everything I have heard about this makes you just physically uncomfortable as the other stuff we have talked about. And I think it is a real issue and in this case I think Adrian Peterson in his comments basically did say it is a thing he grew up with and is culturally what the norm is. I can’t comment on it because it is just so alien to me." Some believe this is just a ploy by Bill Belichick to get LeGarrette Blount to come back for less money than what he wants. Blount is still a free agent and there is no word on whether he has had any dialogue with the Patriots or any other team. Blount scored a franchise record 18 touchdowns last year and rushed for over 1000 yards, but it appears he hasn't received much interest, which could just mean teams think he is a product of New England's system. Either way, the Peterson-to-New England situation is definitely one to keep an eye on over the next day or so.